“Within the Law” is recreating a lost 1917 feature film. ​Over 50 percent of early American cinema is lost—destroyed for one reason or another—-and with it has vanished much of early 20th-century American history, culture, and society. 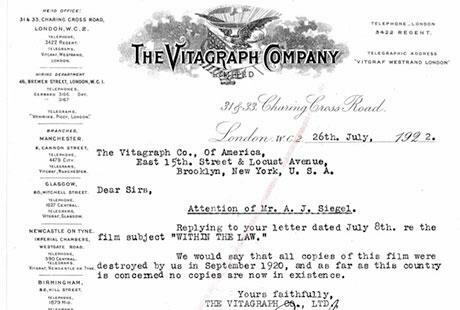 This project invites viewers to participate in the reconstruction of an early silent film based on the film’s surviving clues—the Broadway play it was based on, the musical score (recently discovered) that was composed specifically for it, contemporary press reviews, production stills, and other films from its once-vibrant production company, Brooklyn-based Vitagraph Studios.